As the holidays were approaching this year, I knew the twins were at a challenging age for Christmas decor. They are 20 months old and curiosity is king. They want to grab everything, throw everything, tear paper into a million pieces, dump bins of blocks everywhere, pull everything out of drawers, etc. 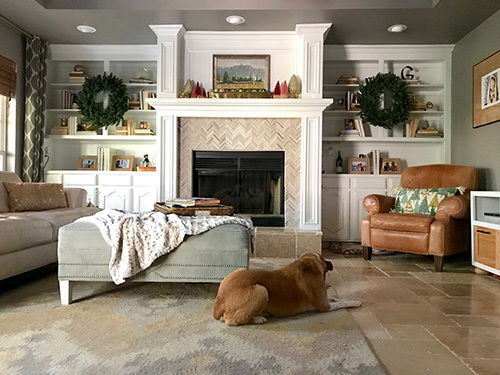 When it was time to decorate for Christmas, I thought about scaling our decor way back. 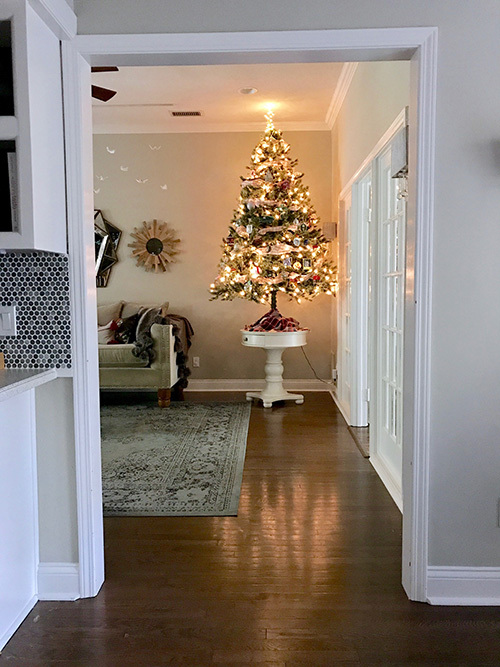 I'm normally that person who puts a Christmas tree in both the formal living room and the den, and I even decorate the laundry room that no one except me really sees. It's a "more is more" situation for me. But more is not more when it's just more stuff that my twins can break, you know? But after chewing on it for a while, I decided that I love decorating for Christmas too much to tone it down. I'm a little bit selfish, OK? 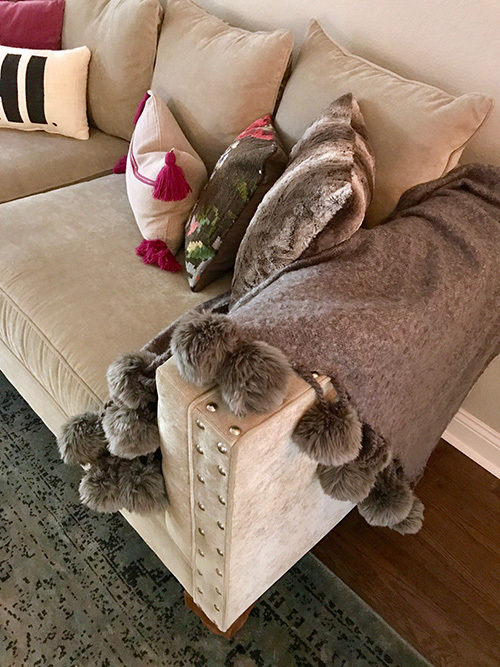 Since decorating makes me happy and I don't want to give it up, I decided to get creative and utilize my Christmas decor in new ways that keep my precious breakables out of the hands of my precious children. First of all, let's see the two toddlers who put me in this conundrum to start with. We got dressed up pretty cute for church this weekend so I had to snap a quick photo. This age is so fun and so unpredictable. It's a miracle when they both look the same direction for a photo. You can see we've started the outside decor but it isn't finished yet, so I won't be sharing that with this home tour. But if you're curious, that's a basic Hobby Lobby berry wreath that I use year-round and simply add stuff to for the different holidays, like this bow and string of jingle bells. The first puzzle I had to solve was the Christmas tree. Normally we have two trees, one in our formal living room and one in our den. In previous years the formal tree housed all my pretty, fancy ornaments, and the tree in the den tree displayed all of our mismatched, sentimental ornaments. I knew right away that two trees were out of the question. 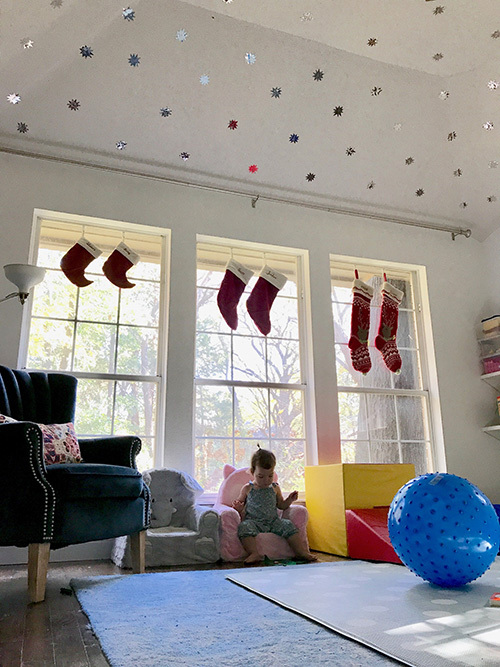 But when I was looking at the formal living room, I thought the ceiling might be high enough for me to put the tree on my side table, out of reach from the toddlers. Sure enough, it worked! 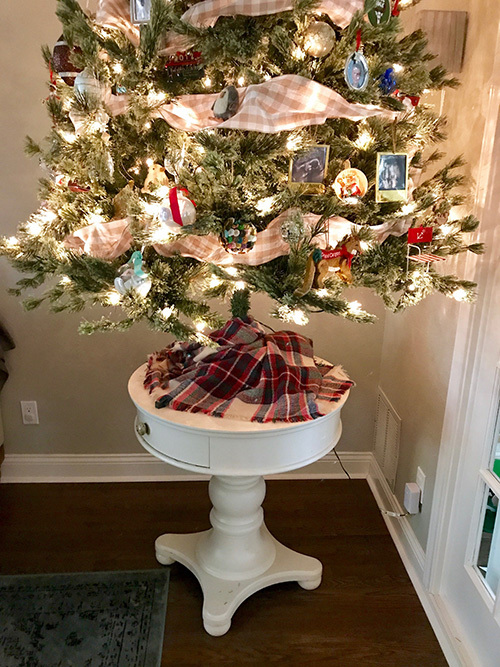 I used some beige gingham ribbon to give the tree a new look, and I focused on displaying our sentimental ornaments instead of the fancy ones. (Keep scrolling to see what I did with the breakable ornaments.) For extra safety, the tree is secured to the wall on both sides with fishing line. The twins really enjoy looking at the tree, but we do have to lift them up and hold them while we talk about the ornaments and show them the details. For example, there is a little mouse family that we wave "Hi!" to every morning, and they love it. 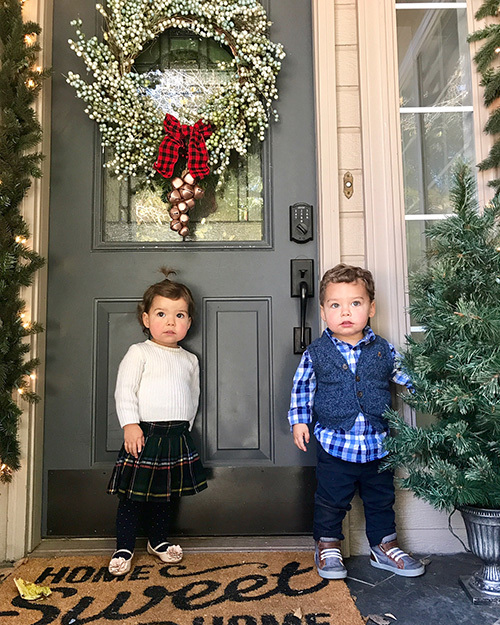 As a mom I feel really good that they get to experience a Christmas tree but also can't destroy it or endanger themselves by breaking a glass ornament or pulling the tree down on themselves. Our tree skirt is one of my scarves, and I used those pink, green and navy colors to pick out some coordinating pillows for the sofa. And how cute is that new charcoal throw from HomeGoods? I'm obsessed with those oversized furry pompoms. 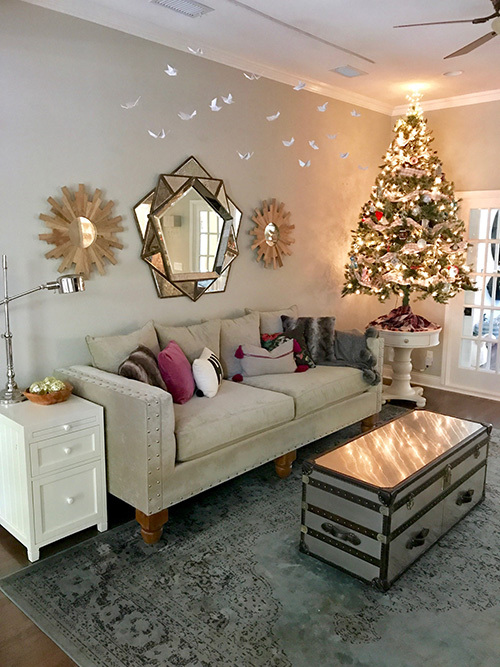 I love the way the tree reflects on our trunk coffee table (a thrift store find we've had forever) which obviously has no decor resting on top because, you know, we have grabby toddlers. 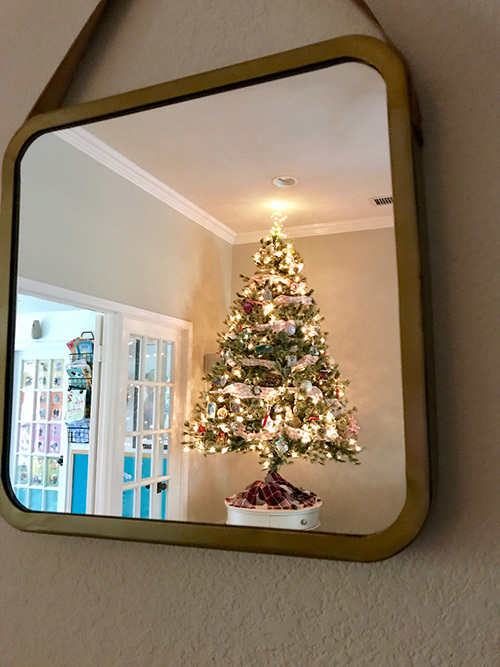 One of my favorite things about Christmas trees is catching unexpected glimpses of them in our mirrors. Double the twinkle-y goodness! 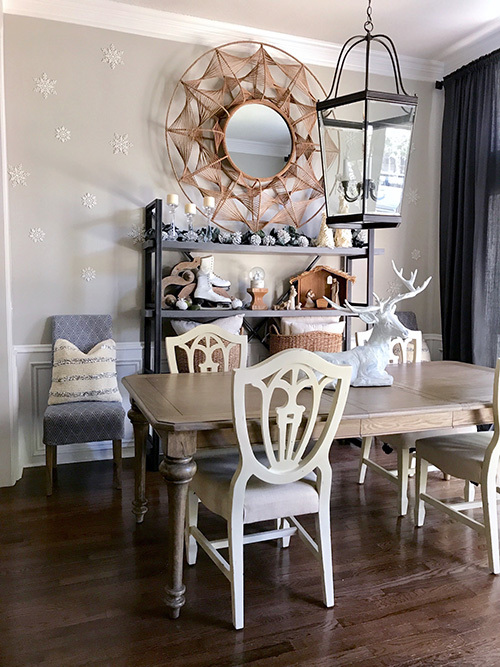 Across from the Christmas tree you'll find our big china cabinet. I decided to use all of my prettiest breakable ornaments for this display, which is safely out of reach of the twins. For the top shelf I moved all the glassware I normally have there to the back and added a string of twinkly LED fairy lights to make it more festive. 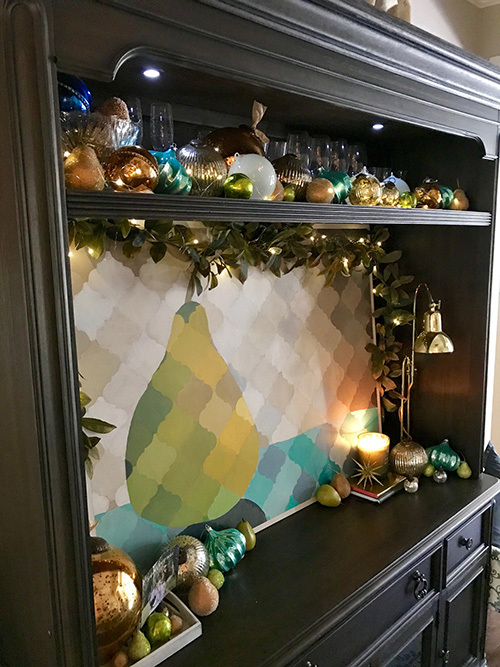 It helps that all of my ornaments already coordinate with my pear painting (still one of my favorite art pieces I've ever done). Obviously I love blues and greens and that love affair extends into my holiday decor. I have amassed this beautiful collection of ornaments from Wisteria by always showing up the day after Christmas to buy them 75% off. The milky blue glass ornaments are my absolute favorites, but I also love those oversized metallic mercury glass baubles. Adjacent to our formal living room is our formal dining room. As with the tree and the china cabinet, the ongoing theme is that I went up high with my decor to keep it out of reach from the kids. In this room I went with a simple, natural woodland theme. I kept everything wood, green and white so that it would feel cohesive. 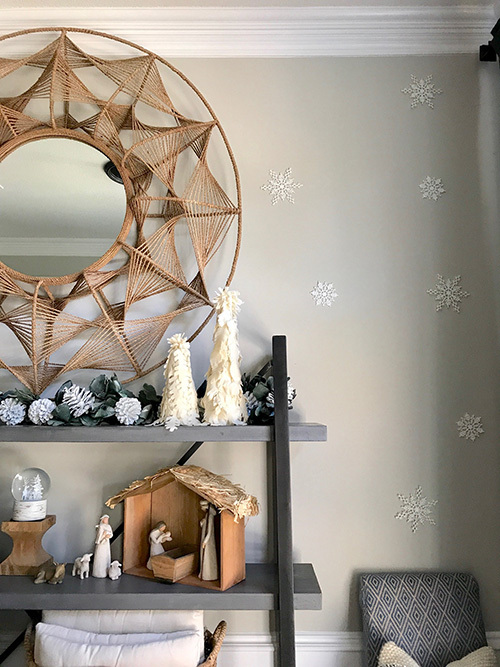 I applied those snowflake ornaments to my wall using sticky tack. The table centerpiece is really simple, just an elegant deer I bought at Wisteria. That's another thing I bought at their amazing post-Christmas sale! I only decorated the top two shelves because those are safe from my twin destroyers. This year the shelves display my Willow Tree nativity set, something I've had several years and love just as much as I did when I bought it. It's a best seller for a reason. Those are my DIY felt trees at the top. 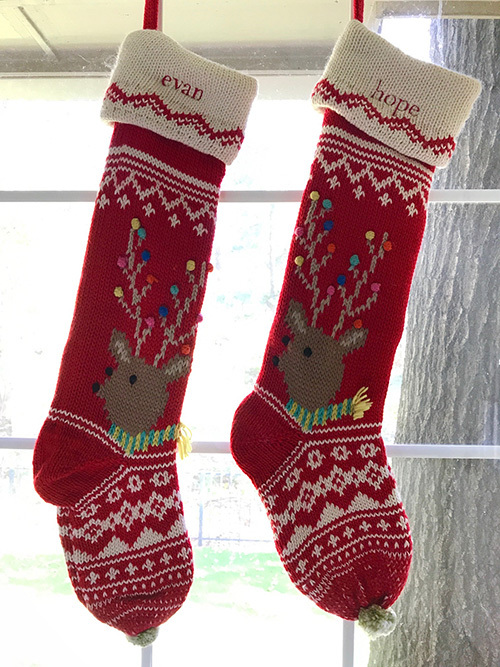 They have held up really well throughout the years and because they are so simple in color and form, they always work perfectly wherever I put them. The other side of the shelves include the candlesticks from our wedding and my thrifted ice skates. 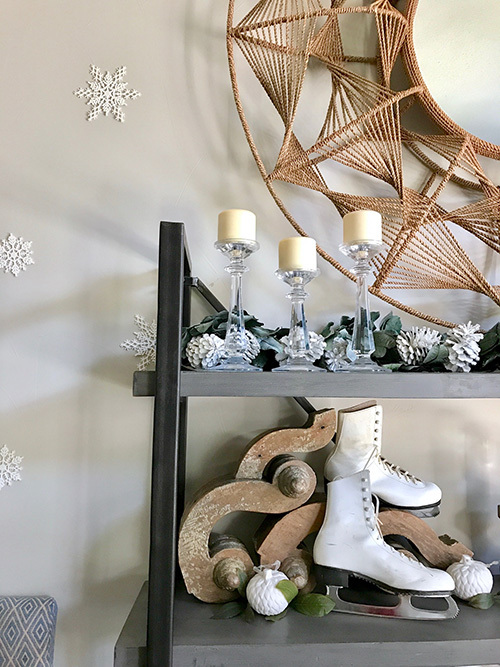 I love the way my cheap snowflake ornaments look on the wall. Those little details excite me even if no one else notices! Over in the den, we kept things really simple. 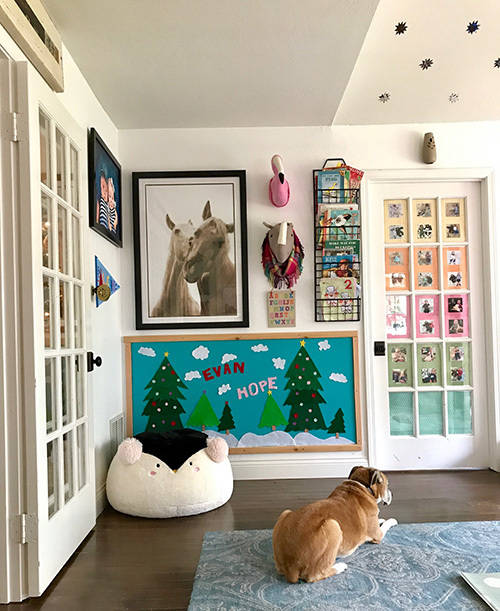 If you'll remember, we chose this as our "adult room" when we had the kids, and I'm dedicated to keeping it calm and serene. The kids do come in here sometimes, but not very often. Still, I had to keep everything out of their reach, which is why you don't see any stockings hanging from our mantel. On either side of the shelves is a battery-operated LED wreath. It twinkles at night and stays off during the day. I debated adding a bow or some other flourish to those wreaths, but at the end of the day I decided to keep it calm and simple. I did get a new Christmas tree pillow from World Market, though. 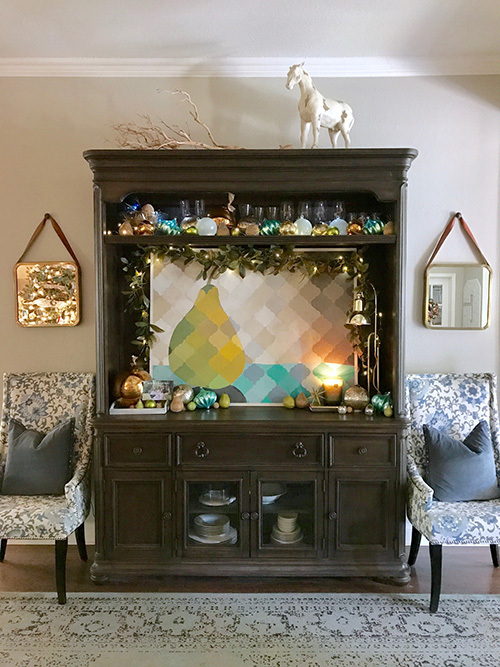 I fell in love with the colors and texture, and then I actually found a Golden Llama (a fun promo they were doing in November) which gave me a $50 gift card to the store. That pillow was the first thing I threw in my cart! My mom gave me those pink bottle brush trees (available at Target - I can't find them online) and I decided to do an colorful display of my other breakable ornaments to tie in with their pink color. 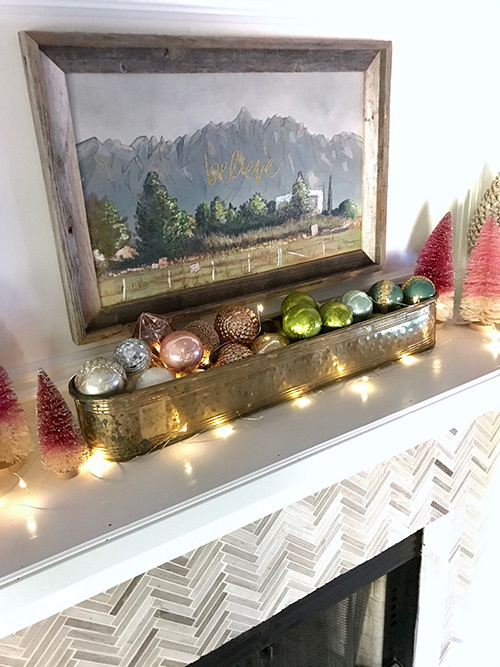 This vignette makes me happy because almost all of those ornaments are thrifted, and so is the brass container. 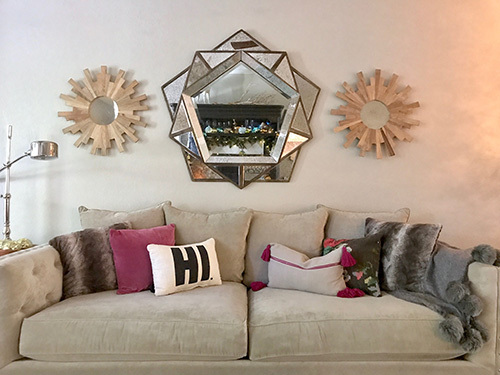 Cheers to decorating on the cheap! That is an original piece of art from my father in law, but I added the gold sparkly "believe" foam sticker on top to make it more seasonal (from Hobby Lobby). Don't worry, it comes right off without messing up the art. Last but not least, our playroom. This is where we decided to display the stockings, again hanging high and out of reach from the twins. My hubby and I also combined our skills to make the twins a felt board as an early Christmas present. I have started them off with Christmas scenes so they can decorate their own trees, but I plan to add more for each season and each thing they are learning, such as numbers and letters. 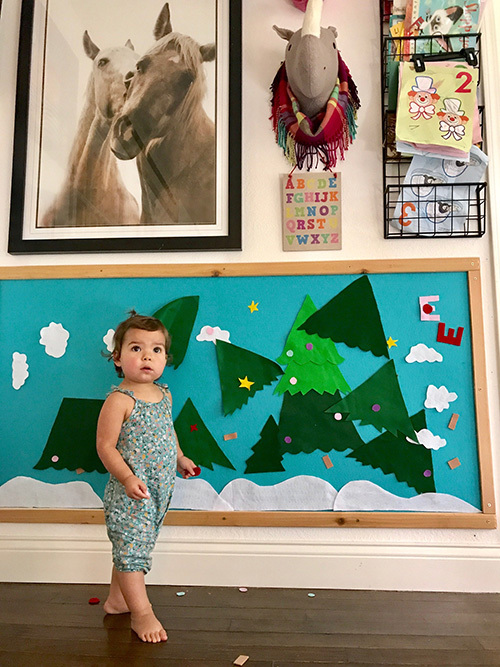 I loved playing with felt boards when I was a child and I hope they use it for many years. I'll write a separate post about it soon, but there really isn't much to it. If you're not familiar with felt boards, it's a very simple concept. Felt sticks to felt, so if you create a board of felt as a background, they can add felt shapes on top and they will stick. It's almost like a flat dollhouse or something. Let their imaginations go wild! Yes, I put a scarf on my rhino head, and yes, I bought a new bean bag at HomeGoods. How could I resist? That wraps up our holiday home tour! It's toddler-proof and a little different from previous years, but I still love the way it turned out. The best part is that I have it all done before December starts so now I can just really enjoy it. Let me know in the comments if you have any questions or want any sources I didn't list here. I'm happy to share!